Chocolate. Almond. Espresso. It’s hard to go wrong with this indulgent trio. 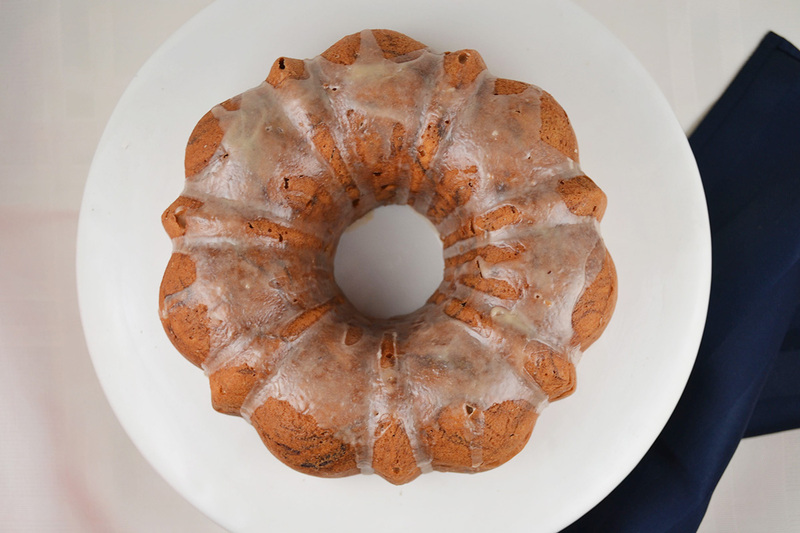 Perfect with coffee or tea, this lovely bundt cake is my grandmother’s marbled almond cake recipe from “The Art of Fine Baking,” topped with a simple espresso glaze. I like to think of it as a Sunday morning cake. The espresso in the glaze can count towards your morning coffee (I’ll take any excuse to eat cake for breakfast). I’ve barely scratched the surface of Paula Peck cake recipes but each one that I make seems to be better than the last. This is yet another example of a fabulous Paula Peck cake creation. The base almond cake recipe is versatile and can be used for many different types of cakes.The texture holds up well to both frosting and glazes, and would make an amazing layer cake with mocha frosting. One of best secrets of this cake recipe is the almond paste. This is what gives the cake its almond flavor but when combined or marbled with chocolate, it’s reminiscent of marzipan. Think chocolate swirled marzipan cake with sweet espresso glaze – are you with me yet? This cake may look like it deserves a special occasion but it’s not necessary. I could tell you that I made this for a fabulous brunch or a breakfast for someone special but the truth is, I just wanted tasty homemade cake. Don’t be shy, you can do it too. Go ahead and make this fluffy marbled almond cake with addictive espresso glaze just for you and your cup of coffee. Grease and flour a 10-inch tube pan or two 6-inch bundt pans. Cream butter and ¼ cup sugar. Add almond paste, a little at a time, creaming well after each addition until mixture looks light and fluffy. Add egg yolks, one at a time. Add vanilla. In the bowl of an electric mixer, add egg whites and salt. Beat on high speed until egg whites hold soft peaks. Then add sugar, one tablespoon at a time, beating constantly until egg whites are firm and hold stiff peaks. Stir ¼ of the stiffly beaten egg whites into creamed almond paste mixture. Pour mixture back over remaining egg whites. Fold together, sprinkling flour as you fold. Add melted chocolate. Marble roughly in batter by drawing through it with a rubber spatula. Pour in prepared pan(s). Bake 1 hour and 15 minutes or until cakes are golden brown and pull away from the sides of the pan(s). When cake(s) are completely cooled, sift confectioners sugar into a medium bowl. Whisk in coffee or espresso. Drizzle the glaze over the cake, allowing it run down the sides. Let set for 1 hour before serving. Just thrilled to find your blog. I have owned hundreds of cookbooks over the years. Among my favorites are the two which were written by your Grandmother. I will never part with either of them. The books are just an enjoyable read and the recipes have never disappointed me. I look forward to following along with your recipes and writings as well. Thanks Janice – it’s great to hear from fans of my grandmother. Her books are one of a kind. Thanks again!